Cashless society, a familiar expression. Everyone has heard it at least once in their lives. Whether you are conscious of the expression or not, it has been thrown around countless times over the last few decades. The words themselves evoke imagery of popular science fiction films, set in the not-too-distant future. If one was to loosen the grip of reality for just a moment, movies like Minority Report and Demolition Man have already painted a clear picture as to what society is to expect for the future of commerce. But what do the words actually mean? What will a cashless society actually necessitate to breach the realm of science fiction and explode into our reality? In Greek mythology, Prometheus is symbolic of forethought, and that was his gift to mankind. Prometheus stole the fire of the gods and gave it to man, as man was not born with any natural defenses for survival except our unique ability to think. This one gift however is a double edged sword. "That which can warm us, can also incinerate us", warns Edwin Black, investigative journalist and New York Times best-selling author. Dressed from head to toe in a sharp black suit, you can immediately tell Edwin Black means business. His silver tie cuts sharply between his jet black jacket, almost matches his hair exactly. Most famous for his investigative expose of the atrocities committed by one of the world's most powerful corporations, IBM, I let his persona and achievements speak for themselves. He has been nominated ten times for a Pulitzer prize and has won many other prestigious awards for his investigative work. He is definitely not one to be intimidated in the face of corporate controversy. Some of Edwin's award-winning bestselling books are IBM and the Holocaust (2001), British Petroleum and the Redline Agreement (2011), The Farhud (2010), Nazi Nexus (2009), The Plan (2008), Internal Combustion (2006), Banking on Baghdad (2004), War Against the Weak (2003) and The Transfer Agreement (1984). What is money? Edwin Black exemplified the historical root of what we know today as money. "You got something, I want it. Am I going to kill you for it? Or am I going to trade you for it? That made economic systems. That meant a unit of monetary exchange. That was cash" he explains bluntly. And several thousand years ago, it was as simple as that. Although I was speaking with a man that is able to face off, eye to eye with a corporation as powerful as IBM, his tough, down to business exterior disappears the moment he flashes a smile. It is a warm, full faced smile that could lighten even the darkest of rooms. When his eyes weren't cutting through to your very core, they were welcoming and gentle. Money served as a common object that would allow people to barter with each other, with something tangible that had an agreed upon value. If a goat herder was selling goats at a market, and another person had a bunch of grapes he wished to trade for a goat, the goat herder may not have been interested in bartering for grapes. This situation would have prevented the grape harvester from obtaining a goat for dinner. Money alleviated this problem by offering an intermediary between the two respected goods, allowing a fair barter to occur. "That was the basis for the cradle of civilization, Mesopotamia, several thousand years ago, with the code of Hammurabi," Edwin explains. Mesopotamia is what we now know today as modern Iraq and the code of Hammurabi is one of the oldest deciphered writings in the world, written in a script known as Cuneiform. It is similar to a modern constitution and listed the laws of trade and commerce, with over one half of the engravings dealing exclusively with matters of contractual law. Edwin Black knows the history of commerce well, as one of his books deals with Iraq and its seven thousand year history, including the earliest of monetary systems, "Banking on Baghdad". Gold and silver coins were cash money all the way through the ages until the early nineteenth century. Every society the world over understood the value of gold and silver and this can be seen in the modern day stock market. As the currencies of nations falter, the value of gold and silver rise. These precious metals have historically been of value and will always be valued. However, carrying around stacks of coinage was impractical and society eventually moved to a paper currency that was linked to a common value of gold. Notes of paper that acted as receipts of gold replaced physical gold or silver coins and were redeemable at local banks for their value in gold. The very first Federal Reserve Bank notes would carry the message "This Note is Redeemable in Gold on Demand", allowing people to still participate in commerce with gold and became known as ‘the gold standard'. The American constitution specifically states that gold and silver are "lawful money" and with the gold standard, this commercial activity could still be defined as ‘constitutional'. The world eventually parted ways with the gold standard, leaving us with a fiat currency, meaning that it only has value because of government regulation or law. For example, the value of the currency is determined by how many units of this currency is in circulation at the time, regulated by the central bank of the nation. This is cash money as we know it today. In the early seventies, credit cards and ‘instant money' were considered to be the holy grail that would form the cashless society - however, these cards themselves haven't actually extinguished society's reliance on cash money, which is obvious today, as cash still actually exists. Magnetic stripes on a plastic card have been used since the early 1960′s. Invented by an IBM engineer named Forrest Parry, these cards were the next step towards a cashless society. They allowed for commerce to take place without the physical exchange of money. This was the cutting edge of technology in the early sixties and it still persists to the modern day. After the magnetic stripes, there is now the relatively new ‘Tap & Go' payment system. This technology is based on NFC (near field communication) and allows the purchaser to simply tap their credit/debit card on a POS (point of sale) device, allowing a transaction to occur. While an older magnetic stripe card requires the magnetic stripe to pass along the physical reader, the near field communication device only requires the chip to be within a specific range of it, as the transaction occurs in three dimensional space. NFC, which is actually RFID (radio frequency identification), is considered cutting edge technology. All modern day credit cards and passports bear an RFID microchip for NFC transactions with relevant readers. But these aren't considered technologies that make up a cashless transaction, are they? They still require something tangible for a transaction to take place. This raises the question that if electronic currency, in the form of a credit card or bank card, couldn't ween the population off of a physical currency, what could? If magnetic stripes were once the pinnacle of commerce, and RFID technology still relies on a similar sized piece of plastic, you could consider them the same. Technology today has radically evolved into a completely unknown beast. Check out the ‘Brain Computer Interface' and come to the realization that the world is ‘moving forward' quicker than you can imagine. It is a device that fuses the nervous system of a patient with electronics, by implanting a computer chip into the motor cortex of a patient's brain, and allows signals sent from the brain to interface with a computer. A person can literally move a mouse cursor on the computer screen with thought alone. This is revolutionary for those suffering a condition known as ‘locked in' syndrome, a debilitating condition which prevents a person from moving or communicating due to near total paralysis. However, the focus is on technology that simply allows for commerce to take place, in a cashless way. Cashless society. A world without cash. It makes sense, we are nearly there if you consider that Internet transactions are basically ‘cashless'. Yet we are still bound to carrying something physical aren't we? Credit cards need wallets, Internet transactions need credit cards. In the late seventies, credit cards didn't create the cashless society. If credit cards that utilize NFC instead of magnetic stripes don't constitute a cashless society, and mobile phones are based on the exact same technology, then the only thing left would be something totally intangible. Would Nazi Germany have been a cashless society? "Nazi Germany would have been a cashless society, because they were already using technical means to deprive people of their cash. It's one thing to confiscate cash, its another thing to prohibit the transmission of cash or the transactions of cash or currency of value based upon electronic means." Edwin continues. "Now, you have heard of the credit society where people are enabled to get credit cards and buy shoes and things at the store based on a credit card, but if your credit goes bad you can't use your credit card. But even if your credit goes bad, you can still take a five dollar bill, go into the grocery store and buy yourself some bread and some milk. "Under the cashless society, with one click, you can be DE-listed from having a transaction. So while you can call it the cashless society, or corporate America or the global corporations can call it a cashless society.. so it's convenient.. so we're not burdened with dollar bills and things. There's a dark side to that. This is Promethean. This is a great convenience and also a great avenue to individual destruction. A great avenue toward the confiscation, not of money, but of personal liberty. "Imagine what would happen if the government in Syria, North Korea, China, Libya, certain parts of the United States and maybe northern Ireland, whatever society you wish to look at, decides that it can push a button a stop somebody from having a transaction. They can already push a button and stop your master card in a moment's notice, but can they actually push a button and stop you from buying bread? That's what the cashless society will do. " "So once you can establish that modality, everything else flows from that. First we invent the gun, then we invent what will do with the gun. Do we defend? Do we hunt for food? Do we murder? Do we mass murder? Do we have target practice? Do we put food on the table?" he says. Edwin continues, "These are the Promethean issues that face us with the cashless society, which is merely the next step in a society which is controlled and mass controlled and centralized". This isn't a ‘conspiracy theory‘, it's a hypothetical situation that can occur tomorrow, as the technology is already being used throughout the world. VISA has already promised a cashless experience for everyone at the 2012 Olympics. ‘Conspiracy theory‘ are trigger words, very powerful ones. Even the most intelligent of people fall victim to the power this expression wields both in its use as a weapon to prevent an epic dialectic, or experience its devastating destructive powers as it is aimed in your direction. Onto the stage and into the lime light steps the Verichip, the world's first and only FDA approved implantable microchip for humans. Get implanted with this RFID chip, and forever you can be ‘read' with a hand held device. Mobile phones are RFID enabled through NFC. Upon the ‘scanning', the RFID chip broadcasts a unique identifier key that allows the ‘reader' to match your unique chip with the relevant database record. There is a night club in Barcelona, Spain, named the Baja Club. Since 2004 it has been offering patrons the opportunity to have themselves implanted with a Verichip. If anyone were to take the club up on in their offer, they are to be afforded access to the VIP section in the nightclub, and not only did they not require photo identification to enter the club, they also had their drink tabs charged to the chip. This, by it's very definition, is a cashless society. 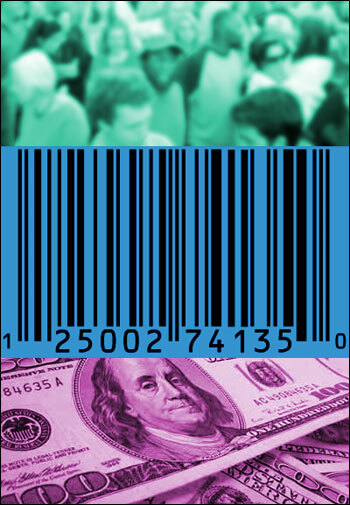 Aforementioned logic dictates that for a cashless society to exist it would need to be totally intangible commerce. Although right now it is limited to a night club party lifestyle, how long would it take for this to spread like an epidemic throughout the world, seeping into every crevice of modern commerce? You may have seen an advertisement on behalf of IBM being played on television (above). This ad, exhibiting IBM's vision of the future market, displays a man walking through a modern day shopping complex slyly packing groceries under his jacket. This continues through the store as he eventually gets to the exit of the store. Throughout the duration of the man's time in the store there is a security guard closely watching, and as he is exiting, he passes through what we can now refer to as an RFID portal. Once the man passes through this portal, a scanning action takes place, as you would expect an item to be passed over a bar code scanner. A receipt is then spat out detailing every item that the man has stuffed under his jacket, and accordingly whatever he has on him, has been charged to his account. Transaction complete. This is the future market. What is specified technologically that could differentiate between the man having a NFC enabled smart phone or an implantable RFID microchip? Absolutely nothing! This is the future of e-Business according to IBM. While supermarket chains like Woolworths offer a customer with the option of self-checkout, it could only be a matter of time until they offer the intangible commercial portal that would enable a consumer to walk through with a packed shopping trolley filled with RFID tagged products, for a truly ‘cash free' experience. Cashless Society. There are only two options before us, for a truly cashless society to exist. One involves our mobile phones incorporating every piece of data usually stored on plastic cards in our wallets - Medicare, licenses, credit and bank cards, etc. Or an implantable RFID microchip. What difference is there, technologically, to what is available today and what was available to the Nazi regime? "The speed is a major difference, what took Hitler repeat efforts with IBM cards, program after program, to register the Jews, to exclude them from society, to confiscate their assets, the fourth area was ghettoization, the fifth is deportation, the sixth is extermination" explains Edwin. "That long process can now be done in a moments notice with a click of a button." "And further than that, in the case of the Nazi, people like my father were able to survive the Nazi onslaught because he had blond hair. Other people were not able to survive because they were required to wear a yellow star, or had an ID card. And anyone who didn't have a yellow star or an ID card, who needed to have one, could be shot. Now what was the purpose of the yellow star? The yellow star was to warn people, theres a Jew there, or this man could not sit on that bench, or this man could not walk into that store, these are Jews." "Now imagine if nobody needs a yellow star, and nobody needs blond or brown hair. And everybody can be identified for their value, for their advocacy, for their enemy character, for their adversary nature. Based up some arbitrarily decided feature. Are they Jews? Are they young protesters in Iran? Are they Wiggers? Are they Tutsi's? Are they Hutu's? Are they the tribe of Gaddafa? Are they from the tribe of eastern Libya? Western Libya?". "Now with the cashless society can you not only turn of the switch of credit, not only can you turn off the Internet of communication, you can actually prohibit people from using the very means that civilization pioneered several thousand years ago that people used to rise above war," Edwin continues, "That was cash". "Just when we were decentralizing our lives, we are centralizing the control of our life", warns Edwin. As technology advances and we as consumers expect life to get easier and more convenient, how are we to know that we aren't going to get burnt? Edwin Black has documented corporate collusion with governments and offers a blunt warning to all who are willing to listen. Is the cashless society the next step towards another holocaust? A technological holocaust, at the discretion of those who control the digital money? If a corporation as large and as influential as IBM can remain as predominant and influential as it is, even with their genocidal history exposed, how can anyone deny a conspiracy exists? This is not the "cashless society" that Hollywood or corporate America would have you believe. Is it?